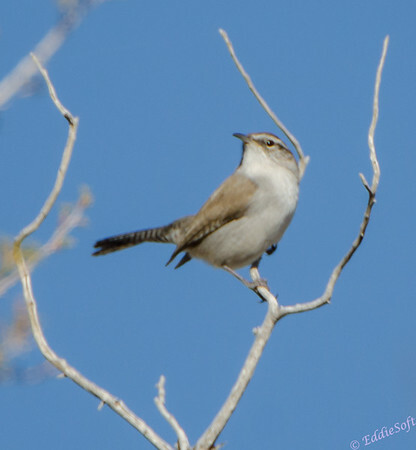 Guess what is so interesting about the Bewick’s Wren… Eye’ll give you a hint, the House Wren doesn’t have a prominent one of these. Figured it out yet? The specimen here has a very prominent white eyebrow (I all but gave it away in my hint misspelling). 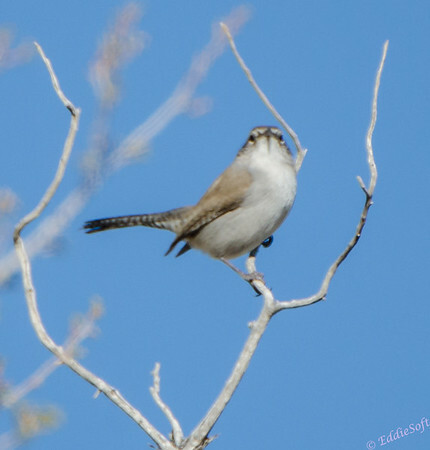 Guess what high tailed, spotted tail and winged creature does… that’s right, this featured bird I believe is a Bewick’s Wren. I saw two different region maps for this birds – on in my reference book has it Summering in the Nevada area, but Cornell’s site has the outline of Nevada cut out of their Summer region. Find it hard to believe a bird stops at the specific boundaries of a state. As mentioned, the shots are a little soft and likely due to me also dismissing the differentiation out in the field – clicking a few quick shots and moving on. Glad I have a rule of at least taking one shot of every bird I come across on a shoot otherwise I would have missed this great find. How about some quick facts about this bird. Cornell mentions they “favor dry brushy areas” which I can confirm having found them in a DESERT! The decline of this bird in the East is directly attributable to the House Wren’s explosion in that region (apparently they have a tendency to removes eggs from nests – bad birdy, verrry bad birrdy!). It is named after engraver Thomas Bewick who found the first specimen. He was a friend of famous birder John James Audubon. Cornell provided this quirky comment from Audubon “Audubon saw another and wrote, ‘I refrained from killing it, in order to observe its habits. '” Well how special. How about we not kill any of them and just observe them. Reminds of the Bryson book, A Short History of Nearly Everything, where he describes the killing of the first sightings of the Dodo bird. They were fascinated that the flocks of birds would scatter after being blasted at and then reform back where they originally were – in which they commented on how stupid that was and then felt obligated to blast again and again until the entire flock was dead – pretty sickening. It was also noted they are extremely hyper, darting about here and there. 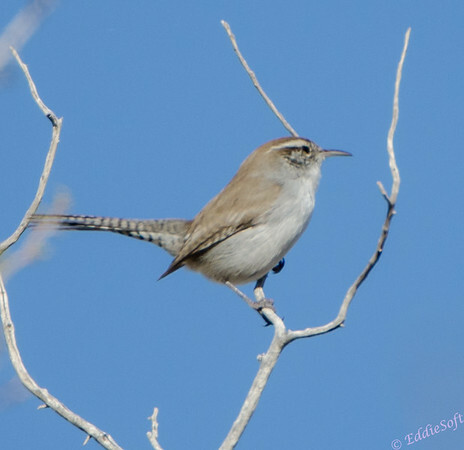 This is pretty consistent with Wrens in general and to be honest the likely reason these shots are a little soft – tough to get a bead on a tiny caffeinated bird with The Beast. That’s all folks. Hope you enjoyed reading about this bird as much as I enjoyed putting the new check mark in the ol’ birding list. This is a new bird to me, too, thanks. I used to be struck that Audubon would kill birds to draw them, but then I thought, How can he draw them in detail when they won’t stay still?? He did more good to save birds by killing one or two to draw them. So I don’t mind. The Dodo birds, well that’s another story. Long live the Dodo – wait… don’t we have a couple hundred of them in Congress at the moment? Yes, and they scatter at every election and then re-form back to where they originally were.